The snow storm which gave us about one half an inch of snow is long gone. The last snow flurries were around 10 PM last night. The temperature did drop last night to around twenty degrees Fahrenheit. However, the bright sunshine is making short work of any snow that it can reach. We are still just below freezing at noon today, but our driveway is bare as are most of the roads. 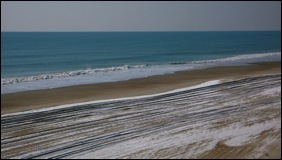 We drove over to Emerald Isle to see how the snow was doing on the beach. It is a mere shadow of itself. One of my neighbors told me that he has been living here for six years, and this is the first snow that he has seen. I guess a snow once every six years is not much to complain about especially since I did not have to shovel any of it. We did make the Roanoke, Va. weather blog. Well it happened. After two years of preaching that we do not have snow down here on the coast, we got some snow. Today, January 20, inauguration day, we got snow. All day I did not think it was going to happen. When I got up just after 7 AM, the temperature was still 40F. However, in three hours until 10 AM the temperature dropped to 34F. By 11 AM the temperature had dropped another two degrees and we were down to freezing. By 12:30 PM we had some light snow. It snowed most of the afternoon, but it was never cold enough for it to freeze on the driveways and roads. The exception to that happened to be bridges, culverts, and shaded spots in the road. The bridge to Emerald Isle was more icy than any of the roads, but they were sanding it as we came over for a visit. 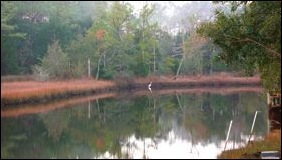 It was very quiet over on Emerald Isle. It would have been a good night for peaceful meal if you could have found a restaurant open. We were happy to have eaten over on the island last night when we had some choice with restaurants. We just got back from spending a few day in Roanoke, Virginia. The temperatures were brutal for Virginia with the low reaching 2F on both Friday and Saturday mornings. 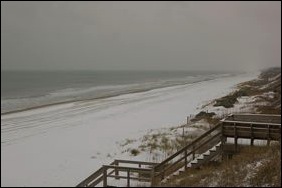 The big news here on the coast is the potential for the first real snow since 2003. I think it is going to be a challenge. As we were out and about today, I saw the temperature hit 56F. This evening just before midnight the temperature remains at 45F. About the only thing we can do is wait and see what happens. If it does snow, I will try to get over to the beach to take some pictures. The weathermen seem convinced that we will see snow tomorrow. Even one to three inches could be pretty.